Allows you to verify hundreds of VAT identification numbers issued by a European Member State. The verification is done against the national VAT database corresponding to the selected Member State. For the purpose of the verification, your request is sent to the national database via a secure Intranet service connecting national Customs and Taxation administrations (VIES) and the reply is sent back in a few seconds. 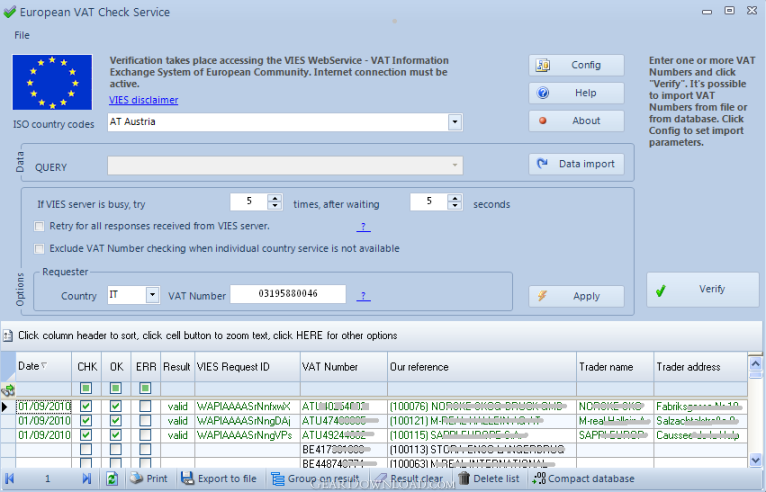 single-click verification of hundreds of VAT identification numbers got from external data sources, allows to get "VIES Request ID", unique consultation number useful if you have to prove to a tax administration of a Member State that you have checked a given VAT number and allows to print and/or export results to file. What's New: Release 3.4 Added full UNICODE support. Release 3.3 Patch for Spanish VATs check. This download (vatcheckservice.msi.zip) was tested thoroughly and was found 100% clean. Click "Report Spyware" link on the top if you found this software contains any form of malware, including but not limited to: spyware, viruses, trojans and backdoors.